Reynvaan Family Vineyards was established by Mike and Gale Reynvaan in 2004. The Reynvaan’s son Matt serves as winemaker. 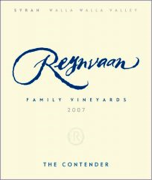 Reynvaan had its inaugural releases last year (see review here), two Syrah-based wines and one white blend. All of Reynvaan wines are from estate fruit. The winery currently has two vineyard sites, In the Rocks, which had its initial plantings in 2005, and Foothills in the Sun, which had its initial plantings in 2007. The family currently has twenty-six acres planted. This second vintage from Reynvaan Family Vineyards builds on the first. Both the In the Rocks Syrah and The Contender show additional depth due to additional age of the vines. The winery has also added a third red wine for the 2008 vintage, The Unnamed, which is a blend of Syrah co-fermented with Viognier. Late last year, Reynvaan announced that vigneron Christophe Baron of Cayuse Vineyards has been working as their viticulture and enology consultant. Baron has been involved in every step at the winery, from helping pick out vineyard sites, to laying out the vineyards, to making the 2007, 2008, and 2009 vintage wines at the Cayuse facility. 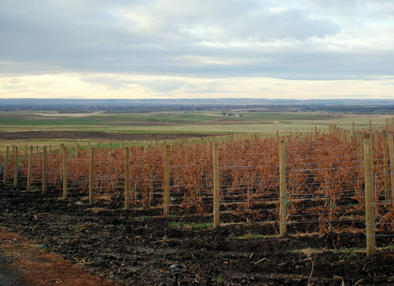 Reynvaan Family Vineyards produces 1,400 cases annually. Wines sampled at 62 degrees. Rating: * (Excellent) A striking, vibrant color. A stinky nose marked by blood, earth, mineral, meat, and violets. A fascinating texture to the palate. A wine to look forward to. Syrah with 10% co-fermented Viognier. Approximately 450 cases produced. To be released 2010. Rating: * (Excellent) A stinky, meaty, gamey, nose that is also marked by violets. More fleshed out along the palate than the 2007. The additional age of the vines – even at one year – shows on this wine that is much more rich on the palate. Syrah co-fermented with 6% Viognier along with a splash of Marsanne. Approximately 450 cases produced. To be released 2010. Rating: ** (Exceptional) A nose full of bloody roast beef and game along with violets and mineral. Thick along the palate with an umami quality and beef flavors. Meaty and intense. Syrah co-fermented with Marsanne. Approximately 450 cases produced. To be released 2010. Reynvaan wine is the best I have ever had! Thank you! We juat uncorked 2009 opened a 2009 In the Rocks Sirah and it was excellent!!!! !